Marsh Lousewort is more common in the westerly parts of the UK and more generally widespread throughout Ireland. It was a member of the Scrophulariaceae (Figwort) family until recently but has now been moved into the Broomrape family. It is characterised by a upright branching stems with feathery-looking leaves, and grows up to 60cm which is much taller than its much commoner relative Pedicularis sylvatica, which only achieves a height of about 20cm. 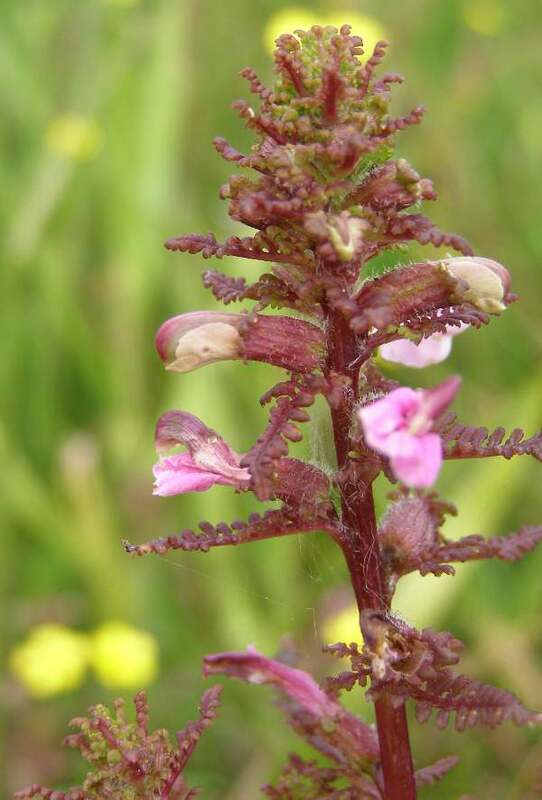 Marsh Lousewort is unlike Pedicularis sylvatica, which grows in acid marshy soils, in another important way, too: it is tolerant of more alkaline soils and so grows in fens such as the Anglesey Fens on the island of Anglesey in North Wales. Marsh Lousewort flowers from April to July. It is a hemiparasitic plant and grows on the roots of other plants close by, from which it gains part of the nutrients it needs for its survival. The specimen shown on this page was photographed at the Anglesey Fens in June.